sleeps 4. 1 Bedroom. 1 Bathroom. Close to the airport and Tony Knowles Coastal Trail, enjoy the comforts of home in a large studio in the historic, established neighborhood of Turnagain. Private entry, full kitchen, queen bed, futon couch, and private balcony. Free WiFi, cable TV, laundry access, and off street parking space. Lending library of Alaskana books and videos. One block walk to bus stop, and just a quarter mile to coastal trail with spectacular views of Cook Inlet, Chugach Mountains, Mt. Denali. Sorry no pets or smoking. Lifelong Alaskan host with Alaska Native heritage. Our home is located historic Turnagain neighborhood. Located a two minute walk from the coastal trail with views of Mt. Denali, Foraker, Susitna and Hunter. It is just three quarter mile to beautiful Westchester Lagoon which maintains duck, bird and fish habitat. It is an easy walk on the trail to downtown. Heading the other direction on the coastal trail, one might see moose in the woods and beautiful views and sandy beach at Pt. Woronzof. 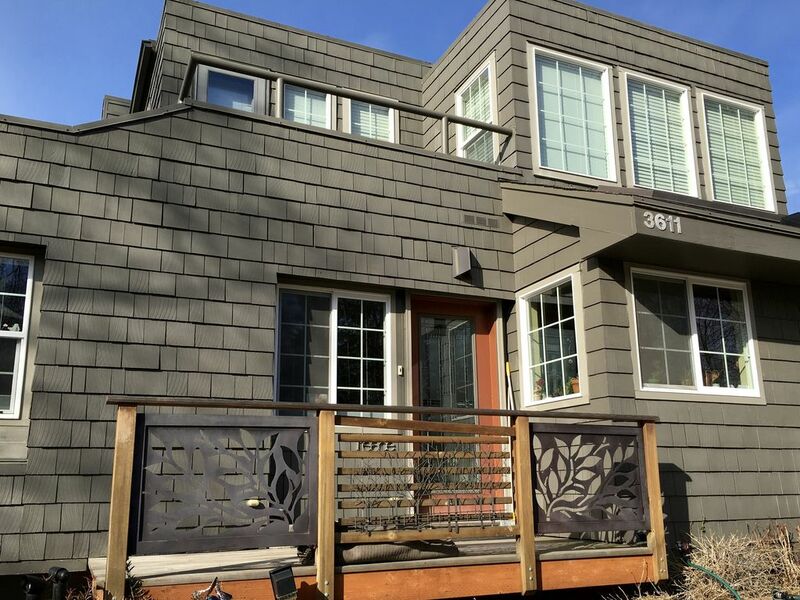 Close to airport, bus, coastal trail, and downtown makes this setting convenient. With a private entrance and off street parking, it still has the homey feeling being an upstairs studio within a home. It has all the comforts and conveniences of home, i.e., internet, cable tv, and washer/dryer. There are beautiful Alaskana pictures on the wall with a growing library of Alaskan books and videos available. It is also a money saver because you can entertain yourself and cook at home! About quarter mile to the coastal trail, views of Mt. Denali, Mt. Forager, and Mt. Susanna can be seen to the north. It's about half a mile to a bike path which is on Cook Inlet waterway. This bike path connects to downtown and intersects to other bike trails in Anchorage. Towels and sheets, comforters and blankets are provided. Six pillows are available as well. Washing facilities are provided for your use or mine. Separate space for the living area. Coffe beans and grinder are provided, a coffee maker, I also provide a variety of teas with a tea water kettle for the stove. Hot chocolate for children! Light breakfast items available as well. Salt, pepper, sugar, creamer, tea and coffee are provided. At times, there are condiments and other staples left from previous guests for your use if you desire. Light breakfast first day. Dishes to serve, cook and bake. Besides toaster, coffee maker, and microwave, there is also a blender for your use. Full kitchen is available with pots and pans to cook and dishes and silverware to serve. Open concept. Can have more room when murphy bed is closed. Very easy to do, no need to strip bed or make it up. Amazon fire stick available. Sign in with your own account for Hulu, Amazon or Netflix. DVDs available. We have Alaskana books available to read during your stay. There's also a variety of brochures and information for travel around the state. There are board and card games available. Puzzles and kid friendly games. Has a patio table and 2 chairs. Roomy enough to bring a couple other chairs out if necessary. We do not have air conditioning, but we do have a fan and windows open. Hosts are knowledgeable about the history of Alaska, Alaska natives, Iditarod sled dogs, and dog racing. Very nice overall, but shower was a little small for my 6ft husband. It was very close to the airport, and the owner gave us an idea of how to navigate the airport for our daytrip to Katmai for bears. So with the windows open, it was a little loud this am with airplane noise, but we are used to that. Would definitely stay here again. To the owner, there was a puddle outside the shower door after each of our showers, so there may be a leak there. Lovely and comfortable vacation rental! Thank you to Fred and Bev for opening you nice studio to us!! We enjoyed it every day of our stay and your warm hospitality as visitors to Alaska! Thank you for your kind words. You two were such low impact guests. I enjoyed hearing about your excursions every now and then. We were so impressed with your interest in learning about alaska and the culture. I have the lovely wooden bowl as a reminder. Hope you’ll come back again. Thanks. Bev and Fred couldn't have been any nicer. Our stay at the their home was just perfect! It was great to meet you. We love guests who go for the gusto and enjoy Alaska to the fullest extent. Thanks for all the goodies you left - Fred, I and our future guests will appreciate it. Come again. All of our needs were met and more so! Great communication before my arrival and I received a warm welcome once there. I loved the location and was pleased to find it was so close to the Tony Knowles Coastal Trail! I had everything I needed and will definitely stay again on future visits! Fantastic location and wonderful hospitality. We felt at home during our stay! Easy to find and close to both the coastal trail/earthquake park and minutes from downtown Anchorage. Definitely a recommended stay, you won't be disappointed! Matt and Ashley were great guests. So quiet, I hardly knew they were home. Took good care of the place, and left lots of extra goodies for next guests. Thank you Ashley for your lovey handmade gift. Would welcome you two back again anytime. Pricing is for 2 people. Maximum people in unit is 4. Extra people $15 day, extra a day.